Boarding the MacRitchie Reservoir, stands the Bukit Location. The most popular 18-hole, par 71 Bukit Course, designed by James Braid, is home for over 3,000 trees of at least 10 varieties. Course length: 6,077 / 5,571 / 5,265 metres (Blue/White/Red). Sime Course is a 18-hole, par 72 course. Course length: 5,851 / 5,518 / 4,998 metres (Blue/White/Red). 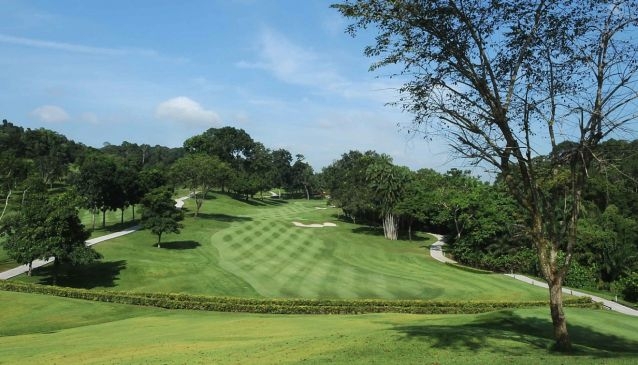 The Island Location, below the Lower Peirce Reservoir offers two 18-hole, par 72 courses. The most challenging New Course, designed by Frank Pennink then Peter Thomson, was carved out of a natural virgin jungle. Course length: 6,506 / 6,174 / 5,840 / 5,345 metres (Black/Blue/White/Red). The hilly and picturesque Island Course, was designed by Peter Robinson and refurbished by Peter Thomson and is the shortest 18-hole golf course. Course length: 5,945 / 5,705 / 5,061 metres (Blue/White/Red). Facilities include: Driving Range, Golf Academy, Jackpot & Video Games, Locker Rooms & Shower, Pro Shop, Spa, Swimming, Table Tennis, Tennis, Billiards, Bowling, Children's Playground, Fitness Centre, restaurants and Banquet Facilities. No walk-in visitors are allowed.